Information security is vital, now more than ever, due to the proliferation of identity and data theft. Secure your business, clients and community from identity and information theft through a community wide shedding event. 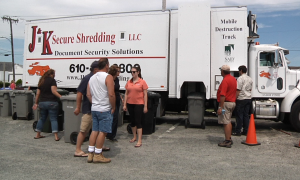 This is a daylong event wherein you, your clients and the community can shred documents with the help of a document scrapping company. J and K Shredding will bring their mobile shredding van and assist people in scrapping hard copies or paper documents that need to be discarded or destroyed. The disposal of paper documents through shredding is vital to prevent information and identity theft. Personal data is a billion dollar business and it getting into the wrong hands can be detrimental to you, your clients and your business. Protect your information – hard copies of pertinent papers responsibly via document shredding. And by setting up an event you are doing your community good in disposing of documents responsibly and setting an example to environmentally friendly disposal of paper. Personal information has become a commodity, and the best way to protect yourself from information theft is the responsible disposal of confidential papers and documents. Community-wide document disposal via shredding helps individuals and businesses protect confidential documents from getting into the wrong hands. It creates awareness and informs everyone about keeping personal data safe. Through this event confidential data is kept out of recycling and garbage bins where thieves dive first. Getting involved with this type of event boosts your enterprise’s reputation. The proper disposal of papers via document shredding shows you take care of the people and companies you work with. This also boosts public relations as it shows your concern for the community and the environment. Since this is a community-wide project, it can be posted on social media and other media outlets in your area. This puts your enterprise in the positive light, strengthening client and supplier relations. Security and sustainability goes hand in hand in the responsible disposal of confidential papers via document shredding. Through partnership with security-trained paper disposal experts, your enterprise exhibits a secure process of attaining personal info from clients as well as from suppliers and the proper disposal of paper copies. Document shredding promotes proper recycling of paper, as the confetti pieces of paper are delivered by the document disposal company to recycling plants. This saves trees, energy and landfill space. Get involved with your community in Philadelphia by organizing a document-shredding event. This promotes security, sustainability and community service.